Mechanistic intersections between metabolic and cardiovascular disorders are increasingly appreciated. Novel pharmacotherapies for diabetes and obesity that may simultaneously impact metabolism and vascular function require careful evaluation from a cardiovascular safety perspective. 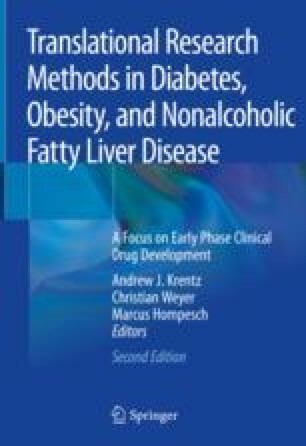 This consideration extends to medications being developed for nonalcoholic fatty liver disease (NAFLD)/nonalcoholic steatohepatitis (NASH). Available methodologies, which may be classified as either invasive or non-invasive, are presently under-utilized in early phase clinical development programs. Baldassarre MPA, Andersen A, Consoli A, Knop FK, Vilsboll T. Cardiovascular biomarkers in clinical studies of type 2 diabetes. Diabetes Obes Metab. 2018; https://doi.org/10.1111/dom.13247. Nicholls SJ, Puri R. Implications of GLAGOV study. Curr Opin Lipidol. 2017; https://doi.org/10.1097/MOL.0000000000000458. Yang X, et al. Impact of ticagrelor and aspirin versus clopidogrel and aspirin in symptomatic patients with peripheral arterial disease: Thrombus burden assessed by optical coherence tomography. Cardiovasc Revasc Med. 2018; https://doi.org/10.1016/j.carrev.2018.02.013. Selvaraj S, et al. Pulmonary hypertension is associated with a higher risk of heart failure hospitalization and mortality in patients with chronic kidney disease: the Jackson Heart Study. Circ Heart Fail. 2017;10. https://doi.org/10.1161/CIRCHEARTFAILURE.116.003940. Gonzalez-Vilcez F, Ares M, Ayuela J, Alonso L. Combined use of pulsed and color M-mode doppler echocardiography for the estimation of pulmonary capillary wedge pressure: an empirical approach based on an analytical relation. J Am Coll Cardiol. 1999;34 https://doi.org/10.1016/S0735-1097(99)00230-2. Vandenberk B, et al. Which QT correction formulae to use for QT monitoring? J Am Heart Assoc. 2016;5 https://doi.org/10.1161/JAHA.116.003264. Li C, et al. Clinical validation of a new wrist continuous noninvasive hemodynamic monitoring system in comparison with invasive radial artery measurement. Blood Press Monit. 2017; https://doi.org/10.1097/MBP.0000000000000262. Baker WL, et al. Effects of sodium-glucose cotransporter 2 inhibitors on 24-hour ambulatory blood pressure: a systematic review and meta-analysis. J Am Heart Assoc. 2017;6 https://doi.org/10.1161/JAHA.117.005686. Ahlqvist E, et al. Novel subgroups of adult-onset diabetes and their association with outcomes: a data-driven cluster analysis of six variables. Lancet Diabetes Endocrinol. 2018; https://doi.org/10.1016/S2213-8587(18)30051-2. Koo BK, et al. Additive effects of PNPLA3 and TM6SF2 on the histological severity of non-alcoholic fatty liver disease. J Gastroenterol Hepatol. 2017; https://doi.org/10.1111/jgh.14056. Moroni L, Selmi C, Angelini C, Meroni PL. Evaluation of endothelial function by flow-mediated dilation: a comprehensive review in rheumatic disease. Arch Immunol Ther Exp (Warsz.). 2017; https://doi.org/10.1007/s00005-017-0465-7. Axtell AL, Gomari FA, Cooke JP. Assessing endothelial vasodilator function with the Endo-PAT 2000. J Vis Exp. 2010; https://doi.org/10.3791/2167. McDermott MM, et al. Six-minute walk is a better outcome than treadmill walking tests in therapeutic trials of patients with peripheral artery disease. Circulation. 2014;130:61–8. https://doi.org/10.1161/CIRCULATIONAHA.114.007002. Morgan MB, Crayford T, Murrin B, Fraser SC. Developing the vascular quality of life questionnaire: a new disease-specific quality of life measurement for use in lower limb ischemia. J Vasc Surg. 2001;33:679–87. https://doi.org/10.1067/mva.2001.112326.